The new Edward Green website launched last week, and it’s very impressive. Unusually for the fashion industry, the site is both attractive and highly functional. The photography and colour palette are lovely, but it also has useful things like ‘My collection‘ that includes all historic purchases by registered customers. And you can browse shoes by colour, style, last or material. Edward Green asked me to write an article for the launch about building a quality shoe collection, so I chose to relate the story of a friend who began investing in shoes a few years ago. Every year, he added another good shoe, slowly building up a collection that became not only more beautiful, but more efficient. The more shoes he had, the less each got worn, and therefore the longer they all lasted. He was so pleased with the accumulative value that after a while he wouldn’t shut up about it. You can read the full story, and his purchases, here. Delivery by courier with DHL ensuring next day delivery in Europe. Free international returns for 14 days. No current shipping to the US. US-dedicated site launching soon. Full retail range available, meaning the great Edward Green widths (B-G) available. No hierarchy to the collection, so browsing my last, colour, material etc as mentioned. The site has been a long time coming, so it’s great to see it finally come to fruition. Every time I saw Euan in recent years, one more issue had reared its ugly head. And I mean it when I saw such sites are rare in our industry. The big designer brands never get it right – focusing too much on ‘recreating the store experience’ and not enough on functionality. People don’t want the store experience online. Digital is not analog. As a product manager it’s one thing I find very frustrating. The photo used on the site is taken from our Tailoring Symposium back in June. There is a detailed post on the clothes in that shoot here. 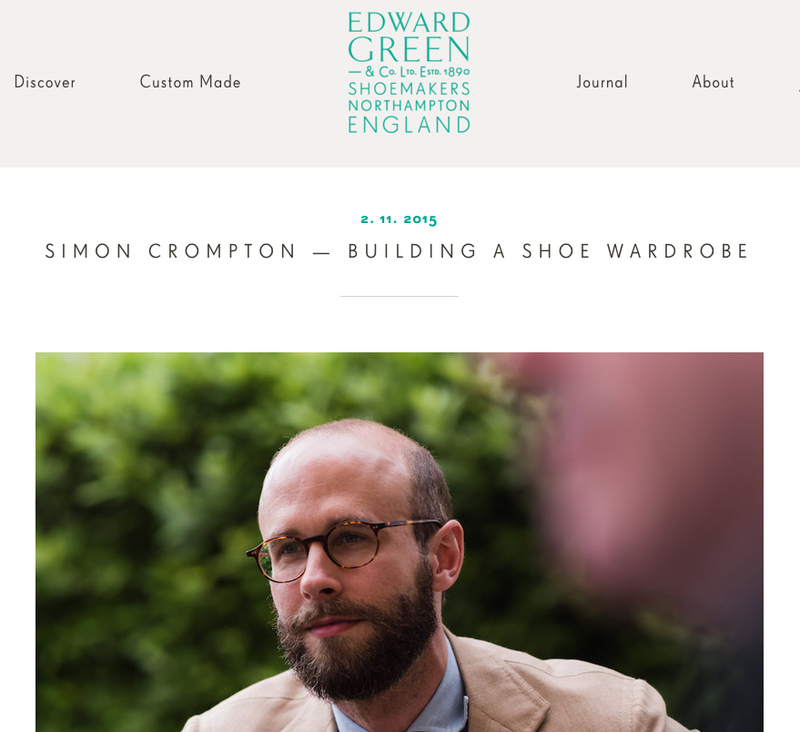 You can follow the discussion on The benefits of building a shoe wardrobe – new Edward Green site by entering your email address in the box below. You will then receive an email every time a new comment is added. These will also contain a link to a page where you can stop the alerts, and remove all of your related data from the site. The shoes mentioned in the story are not bespoke. Why are they better than other and cheaper brands such as Barker, C&J or Loake? Do Edward Green handcut their rtw line? In addition to what Simon has already mentionned, there is one big difference between high end shoes and middle range ones: the amount of leather involved in their construction, that is. One could sum up that difference as leather stiffener vs plastic stiffener. Obviously, these pieces are hidden. But they make a huge difference in how RTW shoes mould to one’s feet in the long run, and not just extending their potential sheer longevity. Of course, this is really worth considering when having to decide over the level of craftsmanship involved in a pair a shoes. Now, if you have started wearing half-canvassed or full-canvassed jackets, as I suspect, then you should buy your shoes matching at least the same level of craftsmanship. I hope this would help clarify the issue you have raised, which is commonly misunderstood even among shoe lovers. Unfortunately, shoemakers wrongly assume we understand these basic things. I really like your post on their new site, reminds me of myself when I started getting into nice shoes at uni. None of my friends could understand it but now they all rush to the Edward green sale every year and buy multiple pairs. I have even caught them preaching the same lines on quality as I used! Simon, do I know you? That friend in the article reminds me of myself !! Apart from being well written that’s a gem of an article describing perfectly the journey we all make after reading Permanent Style. On the subject of differentiating between the Northampton manufacturers why would you steer me away from a Cheaney to an Edward Green ? By sheer happenstance, last night I noticed a change in Edward Green’s ad on your site. So I decided to check how their own website has been improved. Indeed, the new one is way better, a huge change from the former one. Please, do check your story: Fred? Simon – out of curiosity, how do you compare a brand like Edward Green to perhaps Vass Shoes? I understand the price point with Northampton shoes, and you pretty much get what you pay for up to a certain point but Vass shoes are priced much lower than EG, more alone the lines of C&J (probably lower with current exchange rate). Would you say they are therefore on a level with C&J or J Cheaney etc. I agree, I bought a pair of Vass shoes when in Budapest last month and the quality is very good, compared to my C&Js, JC, Churchs etc. However, I have not purchased a pair of EG before – how do they compare? I am just interested since the price point is very different (labour point noted). What a fantastic new site. I have but two pairs of EG (Dover and Asquith) but suspect this collection is about to get a lot bigger. I can see how some may prefer the EG lasts however. Also a big positive for them is that the have a huge range to actually buy online compared to most high end shoe retailers. Shoe websites for years have been woeful I am glad the pace it being picked up. Love the tie you’re wearing in the Edward Green blog photo. Where might it be found? Thank you. I’m extremely bemused about the manner in which your cumuppins were delivered in this instance. This is what you get for educating your friends. Can you help me to further understand why someone would chose Edward Green over Gaziano and Girling or George Cleverley? To be fair at this level a bit of hair splitting is going on. Which at this price level you sometimes need to do. I personally now buy G&G for the last styles, which I prefer over Greens, – this is purley personal taste. I know many who don’t like G&G for the same reason. I love the soles, they seem to wear better and the bevel does give a bit extra support. I have not owned GC yes however will probably be my next purchase. What is great about GC is the different levels of pricing and make so you can buy in at a variety of budgets. I always mention service between the stores but this only really applies if you are shopping in London. There are some models that EG do however that I would buy over any of G&G, GC, Lobb etc.. And that is the boots. The Galway and Shannon are on my wish list. Good post Simon. The new Edward Green website looks really good too. I’m considering the suede Dover derby, but wondered, as have some other posters, about the difference in quality between RTW EG and Gaziano and Girling (who have a similar model – Hove). The former is about £900, the latter (MTO admittedly) £1100. My initial thought was the cost of the G&G probably came mainly from the MTO factor, and was considering sticking with the EG. But, would I actually get more hand-finishing from the GG? Speaking of shoes: may I ask some advice on shoes to wear with white tie and smoking (both of which I occasionally wear). I know the proper shoe would be black patent shoes, but as these seem a bit ridiculous to me, both in terms of the limited number of uses you get from such a shoe and actually the shoe in itself, I wonder whether you have any advice regarding wearing ordinary (black) calf shoes for such occasions. I tend to think that a glossy polished calf leather shoe would be as good as a patent leather shoe. If so, would it be better (i.e. less a break of etiquette) to wear whole cut shoes than cap toes? I have noticed G&G Sinatra as well as St Crispin’s black dress shoes and in theory at least both seem to be possible to wear with white tie/smoking. Most of those wearing such dress at the occasions I visit would, of course, wear much less formal shoes than that, but that would be no reason not to try to keep up some standards. Absolutely Sigurd, I’d avoid patent shoes. Just black shoes covered in plastic. A wholecut will be marginally more formal than a cap toe. Whichever style you go for, make sure they have a high polish! Thanks for the advice. A follow up then: would it be taking it too far to wear black high polish derby’s with formal clothing (including white tie) do you think? I have a follow up question relating to the value for money proposition. EG’s prices seem to have increased very significantly over the past few years. If I’m recalling correctly (and apologies if I’m mistaken) it was only 2 to 3 years ago that a fairly standard model like the Chelsea was priced at somewhere between £550 and £600. It’s now up to £765 (and no doubt rising). That’s a relatively significant increase and while I don’t know how it compares to competitors, I find it hard to justify. EG has obviously experienced considerable rises in popularity over that period of time, it’s a little difficult to avoid the conclusion that they are capitalising on that popularity by increasing prices with nothing (in quality terms) to show for it. Am I wrong? It’s a business like any other, I suppose, but it has made me reluctant to buy them. You’re certainly right, they have gone up, although several other brands have too (G&G similarly). Regarding price (to (Anonymous), Edward Green’s shoes are under-priced, even at £765. The oak bark-tanned sole leather alone takes 1 year to produce. J.M. Weston bought one such tannery which was in financial trouble. That kind of quality is not exactly profitable. The Edward Green upper leathers are top grade calf and the amount of processes involved in constructing their shoes are numerous and require skilled people. They are a world away from high street shoes or even designer brand shoes. Their Goodyear construction makes them long-lasting and economical. I visited the factory and tannery of J.M. Weston several years ago and came away astonished that they only charge £600 or so for their shoes. I would charge double that if I was making them. Thanks Paul and Simon – helpful. I appreciate that a great deal of work and high-cost material goes into each pair, but I’m still not convinced at that level of pricing. For the average consumer, there isn’t much transparency on the precise cost of labour and materials required to produce a pair. (Though you both seem to have the advantage there.) Most consumers would judge value for money by reference to information generally available, such as comparable products from other brands and the extent to which there have been price increases out of proportion with what might be expected. I suppose the closest comparator I can think of is C&J’s hand grade range, which (unless I’m mistaken) also has oak bark tanned soles and very high quality uppers. Yet their prices are considerably lower, hovering around the £500 mark when I last checked. A further concern is that when you’re spending a sum approaching £1,000 (as you will be with some EG models) is it not worth paying the extra few hundred for a hand welted pair of shoes (Saint Crispin’s and the like) rather than a Goodyear welted pair? I don’t think transparency around labour and materials would make much difference. As I have said repeatedly, makers like this are not making vastly different margins (profit). If you were comparing EG to Prada, then there would be a difference, but not with any of the makers we’re discussing. Would you class a double monk as a formal shoe? I’ve seen them worn with chinos and thought the look was quite good. Thanks for the response. Would I be correct in assuming that a suede variant would be a more acceptable pairing in a casual context? Also, is a double monk less formal than a single monk? I can’t agree with your patent v. ordinary shoes proposition. Firstly patent shoes are worn only for the most formal of occasions – ‘ordinary’ shoes bring with them the utilitarian purpose for which they are made – the Oxford toe cap shouts business, whilst the one piece is, for some, less formal than the Oxford. Secondly no other shoe ahead of the patent has the clean, glossy, glass like look required for formal occasions. I also question the hierarchy of shoe formality wherein monks have superiority over derby’s. The hierarchy should be based on the utilitarian aspect of fastening; buckles, laces, to ribbons at the top (the ultra formal pump having decorative ribbon). Buckles also have an association with footware such as children’s shoes, motorcycle boots, female footware etc. It is also worth mentioning that, empirically, few women I know consider them attractive. Thanks. Obviously some subjectivity there. Patent leather is fairly standard for black tie these days. It was created to replicate a highly polished shoe (as Simon states). It’s ersatz. Once you realise that, it never looks the same again! However, most men don’t know how to achieve a mirror-like polish so it serves a useful purpose. By tradition ‘boots’ the street or under-stairs shoe valet would take care of this issue. In reality for many busy men (sans staff) it sits at the bottom of the to-do list. I’d be happy to accept the arguments if they logically stacked up but by definition patent cannot be ersatz (a substitute) if it is only used for one purpose against shoes that are primarily worn for other purposes (business, work etc.). Ironically such is the current widespread use of patent in formal wear that a highly polished oxford is now seen as ersatz – why not just come in your business suit (with briefcase) too? Hi Anon, no doubt you’re right. Tomorrow, I’m off to buy a microwave oven, a digital watch, an elasticated bow tie and a polyester suit. Just out of curiosity – Is a EG/Lobb/Bemer/G&G/SaintC… Shoe really going to last longer than C&J/Carmina/… ? I’m mean, I get that we’re talking different kind of levels of finishings and handwork. But also in durability? Good move Paul, interestingly the digital watch will probably be the most accurate you will own (and you won’t be donating excess profits to a tax avoiding fashion conglomerate), you can marvel at this fact over your TV dinner whilst knowing that should there be any spills the polyester suit and tie can go straight into the wash.
Wonder why the EG online store does not offer VAT deduction for shoes shipped to Hong Kong? Many thanks for your clarification, although I do not agree with the reason. Not providing non-EU customers with the VAT deductions in order to align prices with local retailers is putting the cart before the horse really. And since HK has no sales tax, the retailers here should be able to offer similar prices. Are rents in London much cheaper than that in HK? I very much doubt it. If anything, the salaries of teh sales people would be much higher in the UK. What the retailers have to do is to offer superior customer service – there’s nothing that beats trying the shoes on. In fact I had bought two pairs at the local HK retailer because the sales person was very knowledgeable and helpful. Unfortunately I probably bought the only two pairs they stocked in UK 5.0. I’m sure they’ll be keen to know that Vincent. A question I havent seen asked – what are your thoughts/experience on rubber/metal toe taps for shoes which get more wear (work black oxfords e.t.c) – if so recommendations on places to get it done? I tend to prefers brads (small nails) to toe taps, as there is no sound, but toe taps can work well – and I use one or the other often, as I wear the toes of my shoes quite hard. Not sure if these comments are regularly seen, especially as this is an old thread now. However, hopefully it will be. I am looking to make my first foray into the higher end of the shoe market. I am looking to purchase 3 pairs of shoes to wear both at work (prep school) and socially. I imagine I will be wearing either flannel or chino trousers at work only (no suits), and would like at least one pair to look good with denim jeans. Having looked into brands and prices, it seems my best bet are C+Js. In particular, I thought both black and burgundy Boston loafers, and a dark brown Pembroke derby were my best bet to cover all types of potential colours and materials of clothes. However, I am open to suggestions on both styles and brands. Maybe 2 loafers (my favourite style) is not a good idea? I also hope to add a 4th pair within 3-4 months, probably a suede of some kind for Spring/Summer. Thanks Chris. Always add to old posts, it builds up a great body of knowledge! Thanks for the quick reply. Your choice was exactly was I was thinking would be the best alternative. You know, I’ve never really engaged with Edward green, I appreciate what they do from a build and quality perspective, but find some of their styles a little restrained. I’ve spent years being fascinated by shoes, and have gone up through the obvious layers, starting with Loake, upgrading to the likes of C&J and Cheaney, and then into slightly more interesting brands such as Alfred Sargent (exclusive), and most recently onto Gaziano & Girling. As I went up each layer, I could feel positive advantages to each jump. From Loake to Crockett, it was more elegant lasts, better leather, nicer finishing and attention to detail. Cheaney were much the same albeit, I think, better value these days, as they’re producing to what seems the same quality as C&J but minus the crockett tax. I have a few Alfred Sargent exclusives, and I’ll come back to those in a minute, but will skip on to the Gaziano’s for now. The G&G’s I have are TG73 and are among the best fitting shoes I own, I also appreciate the quality of the leather, the refinement and delicacy of the last and how slim the waist is on them. However, I compare them to my 724 lasted AS moores, and in reality, unless the trained eye spends a LOT of time looking at it, theres almost no visual difference in quality, shape, finishing or elegance. The 724 last is physically almost identical to the TG73 (minute differences in fit aside), the waist is of similar proportions, and the leather is excellent. Where the differences still lie here, is that the AS shoes have the odd bit of slightly poor stitching, or slightly scrappy finishing. It’s something you have to look very hard to see, but its there nonetheless. What I will say is that AS make a lot of other makers look VERY expensive at the moment, as the Moores are HALF the price of my G&G’s and yet, in my opinion, are not all that far away from the same kind of quality, fit, and style. As a result, it’ll be hard for me to justify more G&G based on anything other than the fact that TG73 fits me ever so slightly better, and is a bit of a grail shoe for me in terms of foot hugging glory. If AS happens to fit you perfectly, then they’re among the best value out there at the moment.